Ultracast continue their commitment to modellers of British armour with their latest figure releases. Stock number 35018 is labelled "Canadian/British Tank Crewman Europe - Late 1944-45". This is a full, standing figure clad in Pixie suit with a set of binoculars held in both hands at chest level. To avoid positioning problems, the binoculars are cast in the same piece as both hands. The cuffs of the Pixie Suit sleeves are hollow to further aid positioning of the hands. Nice touch. 35019 is a "Canadian/British Tank Crewman #2 Europe - Late 1944-45".This figure is pointing into the distance. 25020 is "Canadian/British Tank Commander Europe - Late 1944-45". He is standing casually holding a cigarette. Both figures are also wearing the Pixie Suit and wearing RTR berets. These figures are Ultracast's first full figures of armour crew, joining their earlier infantry figures and tank crew sets. 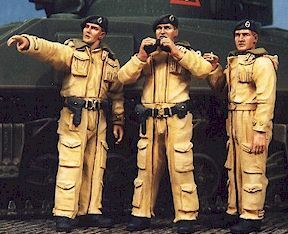 The sculpting quality maintains the very high standards set by Ultracast's previous offerings (see the review of their European Tank Crew set and Tropical Tank Crew set). Fine detail such as fingers, pockets and undercuts of collars are extremely impressive. Casting is close to perfect, with no pin holes, seam lines or overpour evident. Resin parts are connected to casting blocks via thin wedges, minimising the task of removing and cleaning up the components. A transluscent wafer of flash will also have to be removed from between the legs of each figure. Parts breakdown is extremely simple. The torso and legs are moulded as one part, with separate arms and head. Small details such as the pistol holster and puches are cast onto the body. These figures will look good by themselves, with a vehicle, or together in a vignette or diorama. The poses have obviously been chosen to complement each other. Ultracast's sculpting and casting are as good as the best available today. Their continuing commitment to applying this high quality to the relatively underpopulated field of British WWII figures is greatly appreciated. You may view these and other products including excellent photos at Ultracast's Web Site.